An antidote perhaps to the saccharine and commercial fest that Christmas has become Naivety is a contemporary Nativity scene created by looking at the traditional players of the Christmas story and re-inventing them through a contemporary lens. 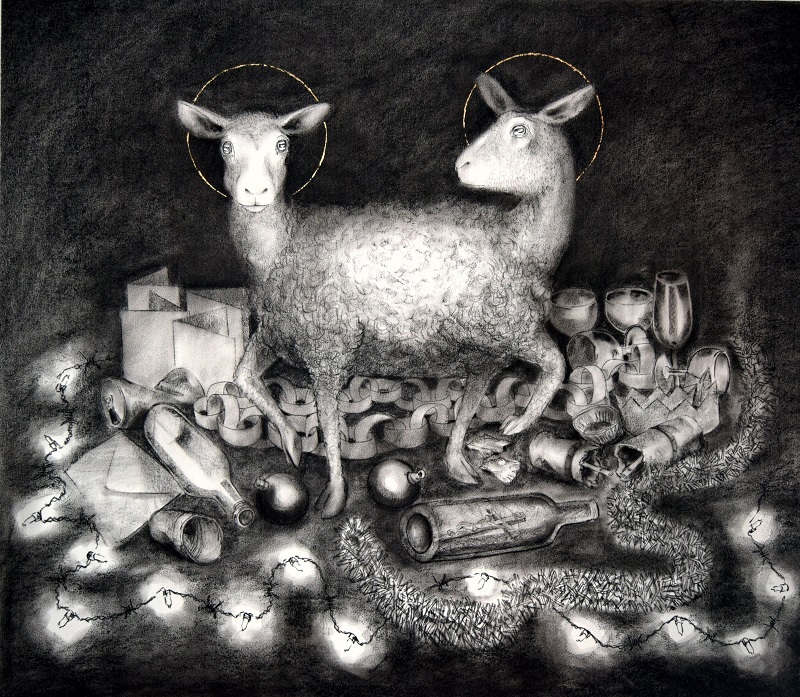 Pete Codling’s large series of charcoal drawings was made with the intention to open some seasonal discussion on what Christmas is about for all of us. It is a body of work which throws up so many questions and sparks interaction between the viewer, the work and the artist which is exactly what the artist thrives on. His ‘take’ on the 3 Wise Men had me asking myself who would I choose to represent that particular visiting delegation in my own imaginary version. The heavenly host of angels are riot police with golden helmet halos, Gandhi has a walk on part as a shepherd, well known faces appear as players and familiar scenarios play out to both jarring and sometimes comically poignant effect. A ‘Conversation’ on the Naivety series took place at the Gallery Friday 11th January between former Director of Aspex Gallery, Portsmouth Les Buckingham and the artist Pete Codling. Les is a former mentor and now long term friend of Pete Codling and has seen his work develop from public sculpture projects and along the way the ‘Million Pebble Project’ and Pete’s recent drawing residency at Portsmouth Cathedral and his then to be shown work ‘Soup of Souls’. Pete Codling is well known and loved locally and always brings local relevance to his projects as well as his strong political beliefs and a sense that art must work towards something and be accessible in a communicative way to everyone. He is a story teller who is also a good listener. Les led Pete through a discussion of each drawing in the Naivety series and the conversation ranged far and wide over Pete’s own Catholic upbringing - Pete know’s his scripture and refers to it in this work - and his views on the Catholic Church in general as well as the place of art in political context and the artist’s current role in uncertain times. I must admit I expected this to be a quiet post Christmas, end of show event but the gallery was gratifyingly standing room only for a long evening of anecdotes and probing questions. As usual I was left wishing the gallery were bigger.